Our Blue Bag Christmas collection has begun. Our goal is 100 bags. Deadline is December 9. Please pick up the blue bag in the foyer, you can download the suggested food list below. Feel free to add more than what is on the list. Please add a decoration to the blue bag. If you need assistance with carrying your bag, please ask Keith or Sue Youngflesh. Your support is very appreciated by all. Thank you! God has so blessed us and is taking such good care of us, it seems only fitting that we should look for every opportunity to do what we do best—give and share what God has given to us. Keith and Sue Youngflesh, along with many other CV members, have been presenting us with ways to share with others. 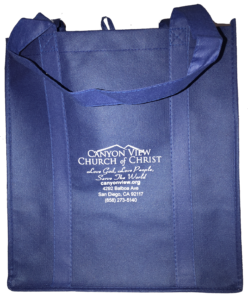 Our yearly giving of Christmas grocery bags has been so successful over the years that we are asking individuals, families, and Life Groups to participate in a monthly food bag program that also advertises our congregation with reusable food bags, imprinted with Canyon View’s information. The food bags are designed to meet the needs of members, neighbors, friends, and family who need food for various reasons: loss of income, lack of work, long-term illness, new to the neighborhood, or a new baby. In the lobby, pick up a Food Shopping List with instructions and a blue Canyon View recyclable bag each month. Buy the items, fill the bag, and drop it off in the lobby. Each bag is approximately $30 worth of food and weighs approximately 17.5 pounds. 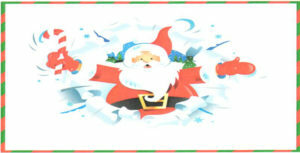 If you can’t shop, but wish to donate money toward a food bag, see Keith and Sue Youngflesh or Barry Day. Again, this year, we hope to provide backpacks and school supplies for 20 students at Kit Carson Elementary School in the Linda Vista area. A bin for contributions will be in the foyer from July 15 – August 19. Suggestion lists are available now to help with your shopping choices. 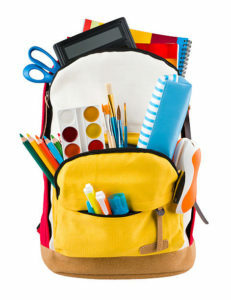 Each year it seems that stores like Walmart, Target, and Staples begin their back-to-school promos and bargains earlier and earlier. If anyone prefers to donate money (cash or check made out to Canyon View), we will gladly do the shopping. 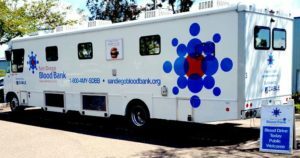 If additional items are donated above and beyond the goal, members can let us know of families that may need this type of help. If you have questions or comments, please talk with Patti Rolla or Carol Simonson. Thank you, in advance, for your continuing support and generous hearts. This ministry has been ongoing for 15 years. Feeding Kids First is an organization in San Diego whose goal is to help children with food-deficit issues at home. Every weekend, there are thousands of children in San Diego County who go home and don’t know if they’ll get a meal before school comes back around on Monday. There is a box in the foyer labeled, “Feeding Kids First,” for those who would like to make a food donation. The last day will be Sunday, June 3rd. Feeding Kids First kindly requests nonperishable, individually packaged foods, such as oatmeal, macaroni and cheese, or fruit snacks. If you’re interested in helping, there will be an information sheet on the box with a more descriptive list of what the organization is looking for. Thank you for your help! 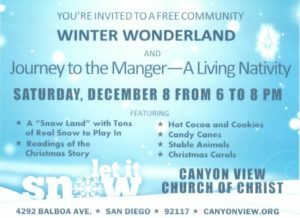 Canyon View will provide 100 bags of groceries to hungry community members as a gift from Jesus this season. The gift will help families have a holiday meal. Lists of food items and bags are available in the foyer. Please, make sure that no food item expiring before January 31, 2018 is placed in your bag. 1. Pick up 2 brown bags (for double bagging) and a food item list. 2. Give your bag a “holiday spirit” by decorating it in a fun and festive way. 3. Fill your doubled bag with the listed items. 4. Place your bag near the podium on or before SUNDAY, DECEMBER 10th. 5. 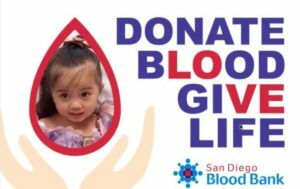 For questions or to request a food bag, contact Sue Youngflesh, (619) 733-1373. 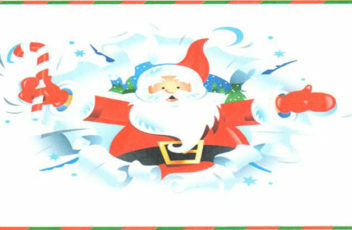 Card”) and put it in the offering plate OR place a check or cash in one of the “donation cans” located at the entrance. It’ a good time for the guys to get together, catch up on what’s going on, and enjoy good food. It’s also a time of prayer so bring your praises and your needs. Come hungry and bring a guest – You’ll be glad you did!